This fall, pre-K through third grade educators from across Minnesota will have the opportunity to join together to learn about and practice ways of increasing and honoring student communication. Research tells us that oral language development is one of the most potent yet underutilized instructional strategies for ensuring children’s success, especially for children from low income communities. Therefore, we developed this free course to support teachers in their efforts to help children find, develop, and use their voices. The course includes 18 online modules and two face-to-face meetings. Each module will allow the participants to practice what they have learned and share their ideas and experiences with the entire learning community. The first four modules will help participants consider practices that support student communication. The modules that will be presented during the fall semester will help participants build their knowledge and practice strategies that promote children’s ability to express themselves. The FirstSchool Online Modules were developed by faculty from the FirstSchool program at the University of North Carolina - Chapel Hill. The course offers us the opportunity for deeper learning and pedagogical precision. The course, entitled The Art of Communication in Classrooms for Young Children, was developed with support from the W. K. Kellogg Foundation and the North Carolina Department of Public Instruction. The course is focused on oral language opportunities in PreK through third grade. The modules are designed to improve student learning, classroom community, and the culture of collaborative inquiry in schools. Knowledge objectives include participants gaining and cultivating understanding of the importance of student communication in classrooms, the role of observational data in improving students’ school experiences and effective ways to support each other’s developing mastery of new instructional and assessment practices. 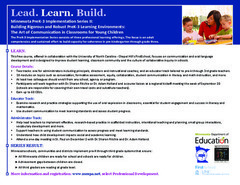 Practice objectives include developing new skills for maximizing opportunities for students to talk and listen throughout the school day, valuing and exercising a mindset of continuous improvement and work with colleagues to strengthen practice; and viewing and use data in new ways to understand children’s school experiences. At least two educators from any school must enroll. A goal of the course is to develop the culture of collaborative inquiry among professionals working in schools, therefore course assignments depend on working with a co-worker. Principals and other instructional leaders may also enroll. Prior to the beginning of the course, each teacher will video themselves teaching a 20 minute literacy lesson and a 20 minute math lesson. These videos will be used periodically throughout the course. Teachers will not have to share their videos with other members of the course. Each week requires approximately 1.5 hours online plus time in your classroom to do the assignment. Each week is designed to be taken online and is self-paced, but must be completed within the week. The module content will need to be reviewed early in the week to ensure completion of the assignments. Most weeks, participants will be posting to an online forum. Go to MESPA's website to Register.